TV Ads For McGinnis listed as Chamber of Commerce. 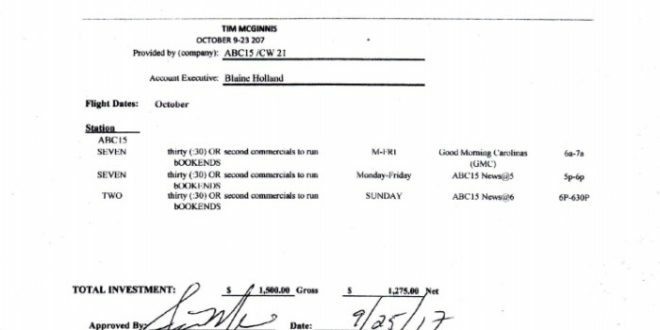 Payment of over $32,000 made to Sinclair Broadcasting (WPDE ABC TV 15) for a $1,500 ad run? 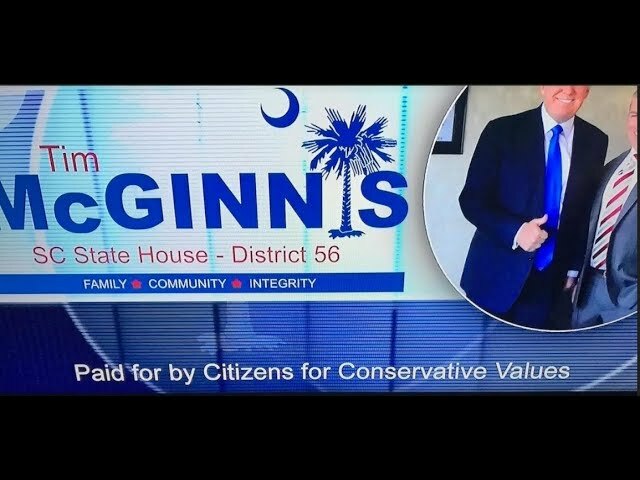 New information uncovered since our previous article on the campaign of House District 56 candidate Tim McGinnis unquestionably demonstrates the Myrtle Beach Area Chamber of Commerce was directly involved in ad buys for the McGinnis campaign from the beginning. The proposal was approved September 25, 2017, by Jackie Miller of Miller Direct, a media marketing firm the Myrtle Beach Chamber uses for out of area marketing ad buys normally associated with funds from tourism development fee revenue. 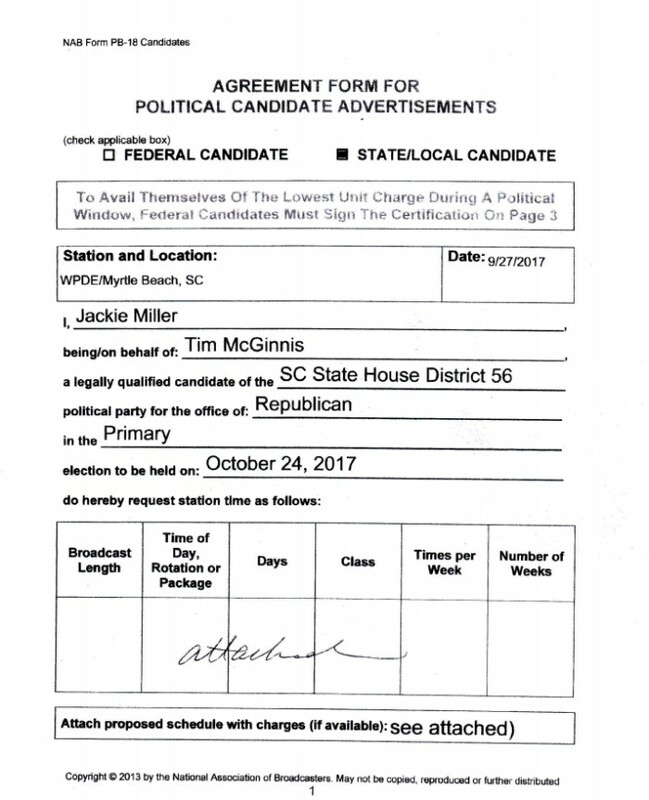 The National Association of Broadcasters political broadcast form (PB 18), filed with WPDE, again has Miller, on behalf of Tim McGinnis, requesting station time and certifying McGinnis is a legally qualified candidate for the House District 56 seat as a Republican in the October 24th primary. The requested station time is exactly the same as the above proposal. The PB 18 includes a page on which it was represented payment for the requested ad broadcasts “has been furnished” by Citizens for Conservative Values. 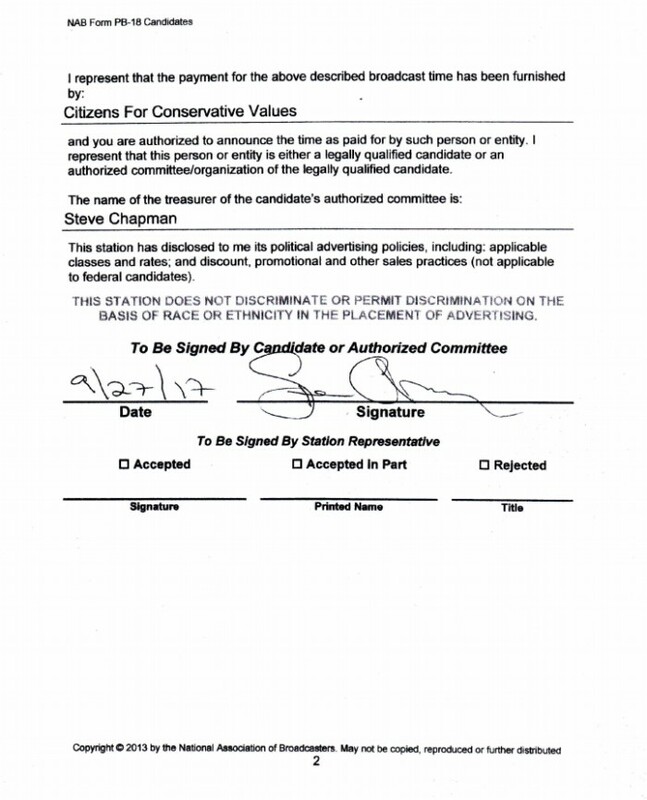 On September 27, 2017, Steve Chapman signed the representation as Treasurer of Citizens for Conservative Values. However, an internal Sinclair Broadcast Group email sent on October 6, 2017, questioned whether payment had been made. 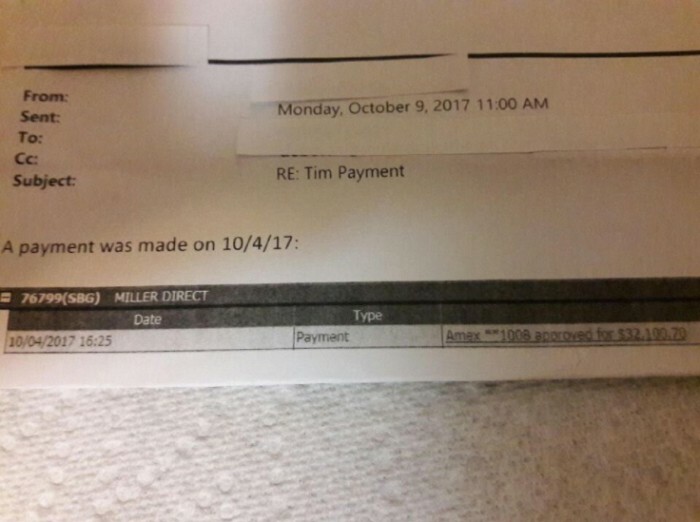 An answering internal email dated October 9, 2017 stated the payment was made on October 4, 2017. Sinclair Broadcast Group is the parent organization of WPDE. AD RUN COST $1,500. AMEX PAYMENT IS FOR $32,100.70? A two line confirmation printout was sent along with the answering email. The confirmation stated the $1,500 for the McGinnis ad buy was paid by an American Express card as part of an overall approval amount of $32,100.70. The confirmation noted the Sinclair Broadcast Group number 76799 with Miller Direct next to the number. The confirmation appears to have Miller Direct paying an overall $32,100.70 to Sinclair Broadcast Group, which included the McGinnis ad buy. As noted above, Miller Direct makes many ad buys throughout the year on behalf of the Myrtle Beach Chamber for out of area marketing paid for with revenue from the tourism development fee. Running the ad buy through a third party political action committee, such as Citizens for Conservative Values, would be a way for the Chamber to skirt state law individual campaign contribution limits to McGinnis. Considering the players involved in this ad buy, it must be questioned whether the origin of the funds used to pay for the McGinnis ads was the tourism development fee? If that proves to be the case, such a payment would be in violation of the state enabling legislation establishing the tourism development fee.